Torr02 - Tom Mann and His Times' was originally intended to be a two-volume biography of Tom Mann by Dona Torr. Volume 1 appeared in 1956, and included some chapters by Christopher Hill and A.L. Morton. Volume 2 never appeared, despite attempts to get Frida Knight to take over the preparation of the volume after Dona Torr's death. This correspondence concerns the preservation and acquisition of information regarding Tom Mann, including his family history and his correspondence, in preparation for writing his biography. This group also contains first drafts of chapters, intended for inclusion, by E.P. Thompson and Christopher Hill. CP/IND/TORR/01/02 - Tom Mann and His Times' was originally intended to be a two-volume biography of Tom Mann by Dona Torr. Volume 1 appeared in 1956, and included some chapters by Christopher Hill and A.L. Morton. Volume 2 never appeared, despite attempts to get Frida Knight to take over the preparation of the volume after Dona Torr's death. Correspondence with: Yvonne Kapp, L.J. Barnes, Birmingham Public Libraries, Diana St. John, Rev. J. Ecclestone, Mrs. A. Fuller, John Saville. This correspondence concerns the preservation and acquisition of information regarding Tom Mann, including his family history and his correspondence, in preparation for writing his biography. CP/IND/TORR/01/03 - Scope and Content: Correspondence with George Matthews, Maurice Cornforth, James Klugmann, E.P. Thompson, Christopher Hill, Harry Pollitt, John Saville, A.L. Morton, Daphne Simon, Jack Cohen, Frida Knight, John Gollan. Christopher Hill's first draft of Chapters 6 and 7 of Volume 1: E.P. 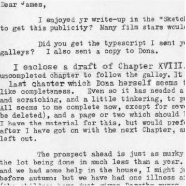 Thompson's first draft of Chapter 18 for Volume 1. When published, Volume 1 had only 17 chapters, and Volume 2 never appeared.